hanks to innovations in science, what had long been deadly diseases are now, in some cases, becoming manageable conditions. In the case of cancer, many patients are living longer than previously expected. According to the American Cancer Society, the cancer death rate has dropped 25 percent from its peak in 1991 and more than 20 million living Americans will have survived cancer by 2026, up from 15.5 million today. As science continues to evolve, creating more survivors, so too does the role of the patient. Today’s patients, like strong-willed K.T., often participate in their own care, researching treatment options and challenging medical decisions as they advocate for their own health. At the same time, patients often face new challenges in seeking to redefine life after a diagnosis. In the case of Meredith, redefining life meant trying to balance caring for her children while undergoing treatments hundreds of miles away from home. Many patients have also become optimistic realists. Tim B. lives with hope for more special moments with family while confronting the fear that his disease might return. And even when their own treatment has ended, many patients, such as Tim G., continue fighting on behalf of those who look to them as advocates for fundraising and inspiration. K.T., Meredith, Tim B. and Tim G. are just four of the many faces of today’s patient who are recasting life beyond diagnosis and treatment. K.T., who took ownership of his treatment during a 15-years battle with cancer, now works as a freelance photographer and walks several miles daily. K.T. heard his doctor’s warnings about the risks associated with treatment, but refused to accept that the cancer could take his life. He had discovered the tumor at age 31, the night before his wedding. Soon diagnosed with cancer, he became determined to focus on spending his life with Kristine, as he had promised—not on suffering or dying from the disease. He informed the doctor he was “different” than other patients. His 15-years battle would prove both of them right. K.T. believes he is alive today because of being “different.” He approached each stage of his treatment—including chemotherapy, radiation and stem cell transplant—with a sense of ownership, challenging assertions and refusing to give up even, when doctors twice informed him there were no more options. A self-described "stubborn introvert," K.T. believes that through cancer he found his voice. He vetoed working with one oncologist because of his bedside manner; another, a surgeon nearing retirement, because of the tremor he noticed when shaking his hand. He insisted on blasting music in his treatment room. When granted permission to walk the hospital hallway, he went outside for a 2-mile stroll. After one of his treatments, K.T. told doctors he’d recover in less than half the time they predicted, and he was right. He kept his information technology job as long as he could, once returning from a lunch break having had port-removal surgery. But the cancer always fought back. One night, he awoke to a loud pop that he says sounded like fireworks. It was the tumor breaking through his collarbone and shoulder. You have to be the strongest voice on your medical team. They have a workload, and so do you. Your workload is to stay alive. — K. T.
His doctor offered condolences and promises to keep him comfortable until the end. Undeterred, K.T. went online to further research his diagnosis and found a doctor on YouTube discussing a clinical trial. Soon, K.T. was traveling from his home in Bear, Delaware, to the trial in Houston, where he stayed with an uncle two hours away to save the little money he had left. Still, his disability payments and wife’s job couldn’t cover the expenses. To save on travel costs, he transferred his trial to New York City, choosing bankruptcy and foreclosure over forgoing participation in a clinical trial. When the trial proved unsuccessful, K.T. consulted yet another hospital, this one in Philadelphia, where doctors initially told him they’d found other potential treatments. But when those treatments didn’t work, K.T. was left again without options. At home, he started grieving in private, unable to tell his wife and son he was expected to die. But then he started researching a treatment that one doctor had mentioned but dismissed. Convinced it could work for him, K.T. called his doctor in New York. Following his last round of treatments, K.T. now shows no evidence of disease. He walks several miles daily, works as a freelance photographer and enjoys time with his wife and 24-year-old son, who barely remembers a time when his dad wasn’t fighting cancer. For K.T., the conclusion of his journey is all the more rewarding knowing that it could have ended so differently. He is living, he believes, because of his fight. Meredith traveled to a hospital hundreds of miles away for cancer treatment while maintaining her role as a mother. Meredith H. decided that while cancer could take her life, it wouldn’t control it. If it was her last Thanksgiving, she wanted to host that Thanksgiving. Three months after Meredith was diagnosed with cancer, she squeezed two tables and 30 family members into one room. Gathered around the meal she insisted on cooking, the family thanked God for medical research and the chance to be together, at least one more time. 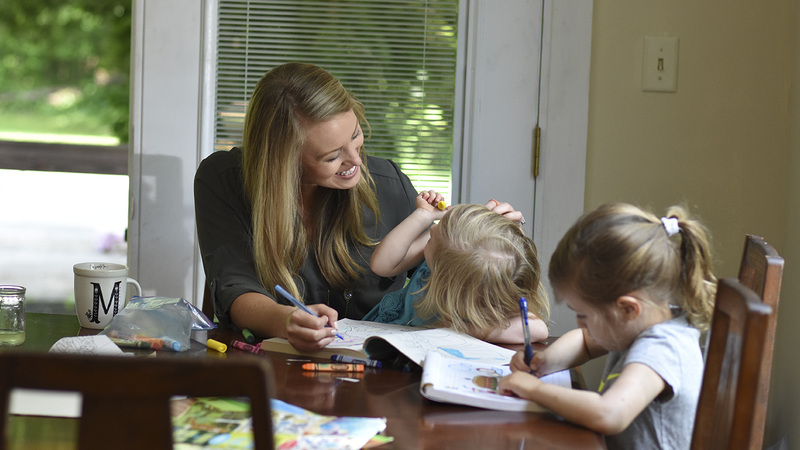 Meredith was 32 in 2014, when she left her job to focus on starting a utilities construction business with her husband, Vic, and spending more time with their daughters, then 4 and 1. It felt like a new chapter of life, with her cancer surgery three years behind them. But while Meredith was visiting family in Mississippi, routine scans showed tumors. The call from the doctor confirming the tumors were cancerous came when she was at her parents’ house. The day after her daughter’s first birthday, she told her parents she had 14 months to live, trying not to cry as the children ran around them. She and Vic made two decisions: they would do whatever it took for Meredith to survive, and the kids’ lives would be disrupted as little as possible. Their first course of action was moving from west Texas to Mississippi. The small towns where she and Vic grew up were more than 150 miles from a major city. Alpine, Texas, was similarly rural, except without two sets of grandparents to support them. In Vic’s parents’ house, they set up a “war room” for finding options that might give Meredith a better chance. Vic temporarily closed the business so they could spend 12 hours a day researching options and calling hospitals. After six weeks of rejection, a spot unexpectedly opened in a Boston-based clinical trial. Meredith began a bi-weekly schedule: a full day of travel on Sunday, including a three-hour drive to Memphis and an indirect flight to Boston; an all-day hospital visit on Monday; and travel back to Mississippi on Tuesday. While Meredith and Vic were in Boston, their parents, who live 40 miles apart, took turns caring for the kids. When Vic began commuting to Texas for work, friends and relatives stepped up to accompany Meredith to the hospital. Over the next year, she made 35 trips to Boston with 17 different people. Meredith would return exhausted and often nauseated. She tried to act like her usual self for her kids—making breakfast, playing in the yard—but, she says, everything seemed so much more rare and meaningful. When she took her oldest daughter to her first movie, she watched the wonder on her face instead of the screen. Then by May 2016, Meredith showed no evidence of her disease. She celebrated what had seemed impossible by resuming her running routine. Now, as she spends her time raising her daughters, growing the business and tending the family’s cattle ranch, she notes that she doesn’t often think about cancer. New friends don’t even know. But sometimes, as she’s watching the girls play, it hits her. Wow, I’m still here, she thinks, tears coming to her eyes, I still get to see this. “I hope I never, ever take it for granted,” she says. For Tim B., surviving cancer means pushing forward while recognizing that the disease could always return, as it already has three times. The first goal was surviving two more years, long enough to see his daughter’s high school graduation. When the cancer again threatened his life six years later Tim B. set another goal for the near future: seeing Laura finish college that year, and his son, John, accept his high school diploma. A lifelong athlete, Tim considered cancer a competition that required the same mental focus and desire to win as in the sports he played. He had to win each game before looking to the next season. While Tim’s health has stabilized over the last year, surviving means pushing forward yet recognizing that the cancer could always return—as it already has three times, over nine years and through seven surgeries. Tim was diagnosed with cancer in 2008, during the time he was training for a triathlon. Despite chemotherapy and four surgeries, the cancer returned and spread the following year. Following another surgery to remove that cancer, Tim got back to his job in estate planning after four days and back on his bike after 11 days. But in 2014, after another surgery to remove cancer from three more areas in his body, Tim experienced a complication that caused the worst pain of his life. As he headed into the emergency room, he said goodbye to his wife, just in case. I kept it short term because I simply didn’t know. Is the cancer going to spread? Are they going to do a scan and say, ‘Sorry, you’ve got it all over the place.’? — Tim B. Throughout the nine years Tim has faced cancer, he never felt compelled to celebrate clear scans, as some patients do. He remained focused on staying active through hiking and biking near his home in New Jersey, and enhanced his diet to focus on foods with cancer-fighting properties. It did once again in 2015, in the form of tumors in previously unaffected parts of his body. But after an additional treatment, Tim’s tumors have shrunk and he has stabilized. At 52, Tim is looking ahead to milestones he once thought he’d miss: his daughter’s wedding and his son starting graduate school. While the back-of-the-mind worries about his health remain, so does his determination to move forward. The kindness of friends and strangers during his cancer battle inspired Tim G. to dedicate his career to cancer advocacy. Tim G. says he wouldn’t change the past three years of his life, because he wouldn’t have found his purpose in life if not for the cancer. In August 2014, the oncologist who diagnosed Tim with cancer gave him 12 to 18 months to live. The second doctor’s prognosis was worse: seven to nine months. Tim couldn’t process the news that the cancer had spread to multiple areas throughout his body. As a single 28-year-old living in his hometown of Kansas City, Missouri, his main objectives were partying with buddies and watching baseball. He felt perfectly healthy, and yet he was dying. But he didn’t have much time to grieve. The days ahead were too uplifting. Almost immediately, friends started a fundraiser for Tim to help with medical costs. Within four days, friends and strangers alike gave $16,000 to a fundraiser that asked fans to translate his favorite team’s game wins into $10 GoFundMe donations. As Tim promised to beat the odds, his team was doing the same—overcoming a losing record in historic fashion. Seeing the parallels between the fan and his team, local media outlets began covering Tim’s story, from the initial fundraising effort to the viral video of him dancing in the hospital, celebrating good treatment news alongside his medical team. And his team too, embraced his fight, inviting him to games, practices and post-game parties. Suddenly, Tim was a local celebrity, celebrating alongside his favorite players. “If I had to rate the last year on a scale of one to 17, it would definitely be a 38,” Tim told his local newspaper in August 2015, although the cancer had then spread further. But more than the brushes with fame, Tim valued the people who went out of their way to help, like the strangers who gave donations and the former classmates who visited him though they hadn’t talked in years. Once good things start happening to you because of other people, you want to become that person for somebody else. —Tim G.
Those acts of kindness are on Tim’s mind now that he calls himself a survivor. He doesn’t want to have overcome cancer only to return to a career that lacked passion and a life he lived only for himself. Tim has started volunteering for the first time. Every Monday, he takes his dog, Dexter, to cheer up patients at a local children’s hospital. He serves on a patient advocacy panel at the hospital where he was treated. And he participates in numerous fundraisers for cancer-related groups, having organized a stand-up comedy show for one and joined a date auction for another. Drawing from his media and speaking experiences, Tim also hopes to create videos for cancer patients in which he’ll ask experts and fellow survivors for information and advice. Tim hopes to convey the idea that facing cancer can bring purpose, the way it did for him.